The Institute of Design was approached by the Illinois Department of Commerce and Economic Opportunity (DCEO) to envision and create a solution for how new and existing businesses are created and sustained within the state. Illinois Governor, Bruce Rauner issued a mandate stating that a new solution was to be created within two years. The DCEO's working title for the project was "OneStop." 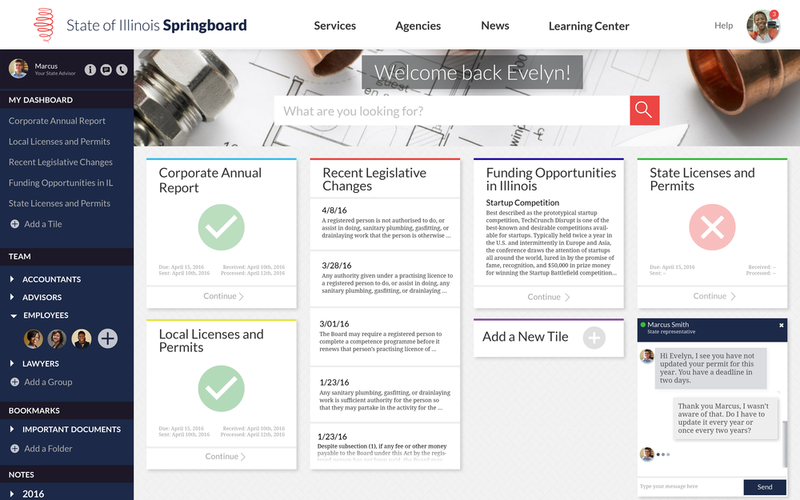 The idea being that the new solution would be a digital one-stop-shop for business owners to work on their business. 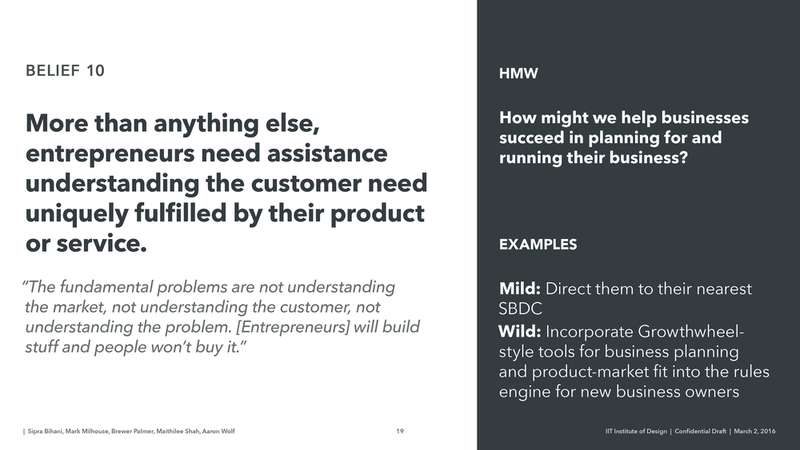 Being user-centered designers, we wanted to better understand the problem. 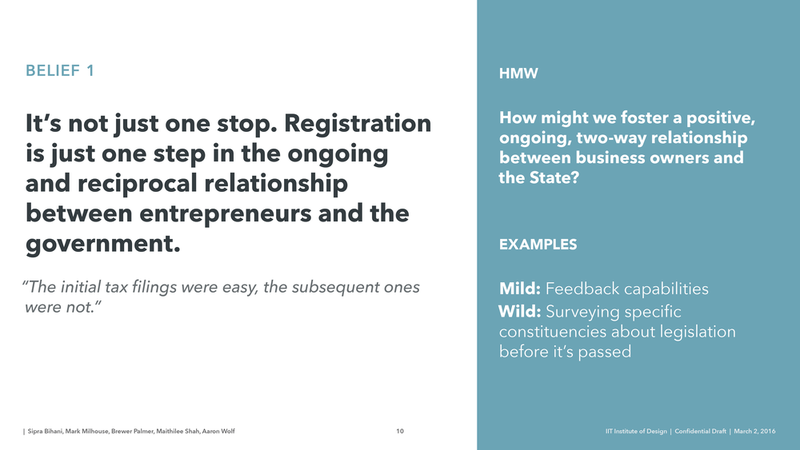 We first created a large body of research to understand state stakeholders, potential new entrepreneurs, existing business owners, lawyers, accountants, and organization leaders. 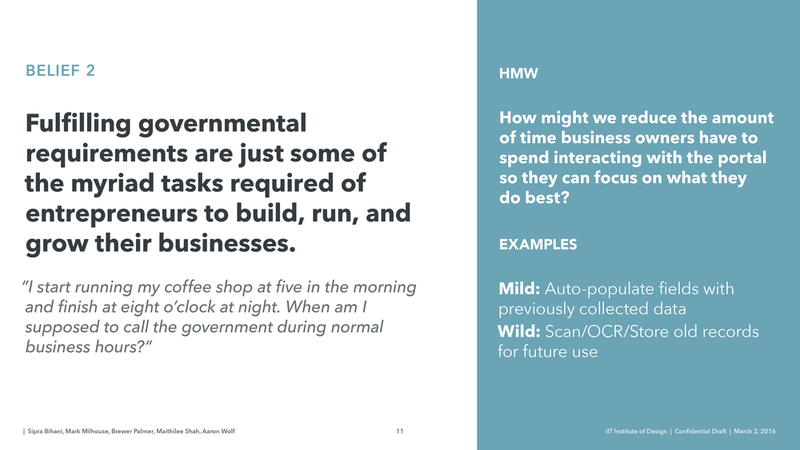 We wanted to challenge the state's understanding of what it means to provide a government service to citizens and show them what opportunities might exist given different approaches. Ellen: "As the owner of a coffee shop, I wanted to enroll in a state-sponsored program that allowed me to help handicapped youth find employment opportunities in my store. I filled out over 40 hours of paperwork to be part of this program and submitted it. 3 months later, I get a letter from the State Department that said that the program had been cut. I had just wasted so much of my time. I feel like I'm always fighting the state, like they're not on my side." In our research, we had to understand a multitude of stakeholders. There were entrepreneurs who may be looking to start a business, small business owners, medium and large business owners, lawyers, accountants, employees, and state actors from dozens of regulatory agencies. The real challenge was to see the problem from many different perspectives: small business owners expect very different services from a system than the CEO of a large corporation. It was also important to pay attention to internal systems. 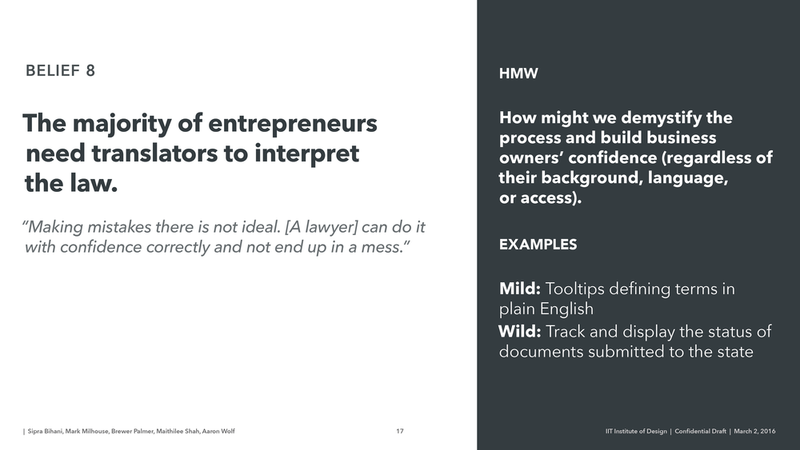 For our analysis phase, we wanted to understand all of the modes of an entrepreneur. We found that people are either working on the business or working in the business. This was an important distinction because it helped us understand some of the differences between a large business owner who has capital to have others take care of logistics like taxes and regulatory issues while a small business owner does not. Another important piece that we found in analysis was that people don't just need help fulfilling government requirements. There are significant tasks for business owners to tackle in terms of building, running, and growing a business. Additionally, when exploring outside resources, we found that new and small business owners (the people most in need of help) were often paralyzed by too much information and yet not enough pertinent information for their exact business. For our synthesis phase, we created core beliefs from our research as well as How Might We statements. 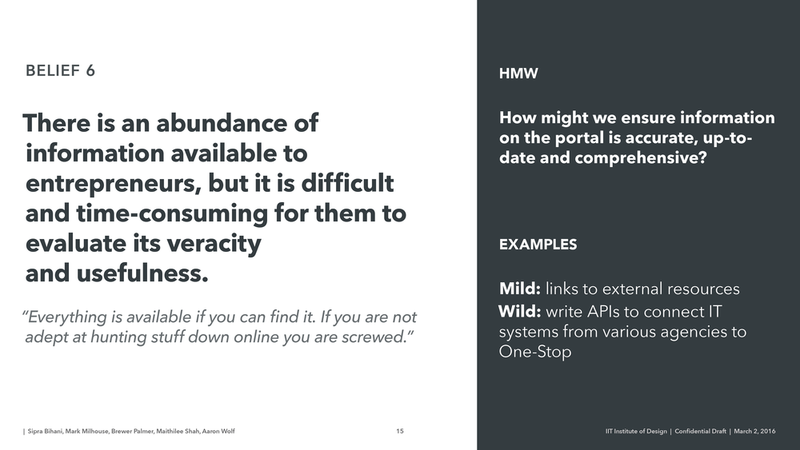 We combined each of these with stories from our research (as well as possible examples from mild to wild). Another great piece of synthesis was to understand where this new system would take place and what the connections to existing stakeholders would be. We wanted to ensure that the portal (here called One Stop) would not be managed by too many organizations at once. Instead, they could work directly through the DCEO. Additionally, we wanted to make sure that different business owners and outside experts could access the system at a level that made sense for them.